What are we to make of living in ruins: centuries of environmental degradation, forced migration, racism, species extermination, unforgivable debt? Ruins proliferate even as we inhabit a seemingly golden age of technoscientific invention: space travel, genome editing, webs of symbiotic, invasive, and artificial intelligence. The paradoxes within which we live and die are not hard to see. The critical challenge lies in describing their entanglement and imagining alternative futures. What is the work of art in an age of unprecedented creativities and catastrophes that unfold and bind across multiple scales of time, place, and being? By close-ups of the things around us, by focusing on hidden details of familiar objects, by exploring commonplace milieus under the ingenious guidance of the camera, the film, on the one hand, extends our comprehension of the necessities which rule our lives: on the other hand, it manages to assure us of an immense and unexpected field of action . . . With the close-up, space expands; with slow motion, movement is extended. The enlargement of a snapshot does not simply render more precise what in any case was visible, though unclear: it reveals entirely new structural formations of the subject. So, too, slow motion not only presents familiar qualities of movement but reveals in them entirely unknown ones. Some eighty years later, a different machine runs through our everyday milieus, infrastructures, and bodies, and it affords an unprecedented view into a disturbing epoch. This machine is the digital computer. And the proposed term for the new epoch is the Anthropocene, a critical state of affairs in which human industry has become a biogeochemical force wreaking irreversible havoc and enveloping the planet (and us) with an indelible crust composed of plastic, radioactivity, heavy metals, and toxic waste. Key to our conceptualization of the Anthropocene are the data-driven model, the satellite image, the Google Earth god’s-eye view. While the photographic and cinematic image offer forensic close-ups and specificities, Anthropocene imagery tends to offer a detached and holistic view of a free-floating planet—a homogeneous sphere or world system that can be fully captured on a single screen. Art historian T. J. Demos critically rejects Anthropocene rhetoric because it hinges on a universalizing logic that “enables the military-state-corporate apparatus to disavow responsibility for the differentiated impacts of climate change, effectively obscuring the accountability behind the mounting eco-catastrophe and inadvertently making us all complicit in its destructive project.” Universalized images obscure and depoliticize by naturalizing sociopolitical injustices. However, images, models, maps, and metaphors are power tools and game changers. As thinkers-makers of media, we cannot afford to simply reject these hard-earned apparatuses outright. The work of art lies in creative experimentation, in dreaming up the many possible answers to the question of how we might make worlds otherwise. How might we attend to the heterogeneous materialities of more-than-human ways of life while rendering visible the enduring violences of colonialism, capitalism, and globalization? How might we reconcile the situated and unruly with the pervasive and structural? Articulating the processes through which difference and collectivity emerge across multiple scales is crucial to struggles for multispecies livability. We need new figurations, new genres, new heroes and companions. At the same time, we need to move away from technopositivist delusions of human exceptionalism and learn to live well with species upon whom we have depended for centuries. Over the last few years, I have had the pleasure of collaborating on a few projects that play at the intersection of digital humanities, environmental anthropology, and contemporary art. Made in the spirit of experimentation and curiosity, each project seeks to unpack the aforementioned puzzles through close attention to plants and the multiple temporalities they enact. In this section, I briefly describe three kinds of clocks, and in the next section, I outline methods that tie them together. Chronometers for Time Travelers (figure 1) is a quartet of clocks made in collaboration with software artist Nik Hanselmann. It visualizes the copresence of multiple tempos. 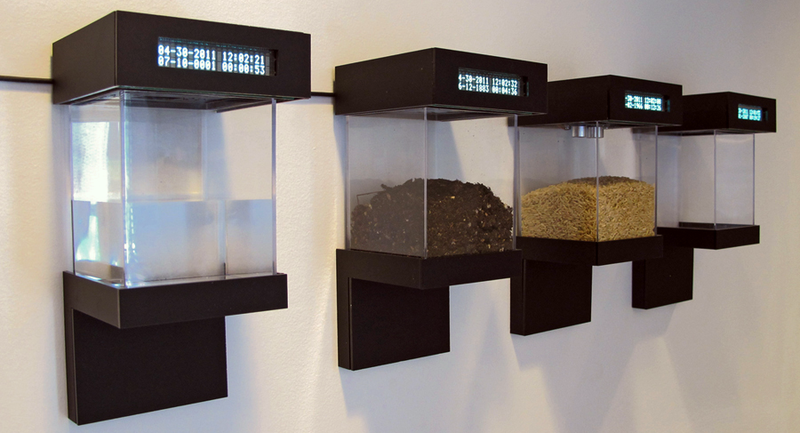 Four plexiglass containers represent an assemblage that is essential to rice agriculture: water, soil, seeds, and air. Each container holds a sensor that reads a rate of change (for instance, water evaporation) and a screen that displays time passing. Each screen displays two times. The top line on each screen gives the time we read on our watches. The bottom lines differ from clock to clock: each is set to begin in a particular year and then incrementally tracks time based on the rate of change for that particular material. For example, water begins in Year 0; the time of soil begins in 1866 to index land colonizations; rice time begins in 1961 with a green revolution; and air time begins in 1970 to index neoliberal globalization. The viewer is placed in a time contemporary to these differential histories and rates of change. Fungal Clock (figure 2) is an ongoing browser-based project that tells a story about multispecies life in a satoyama forest in Japan. 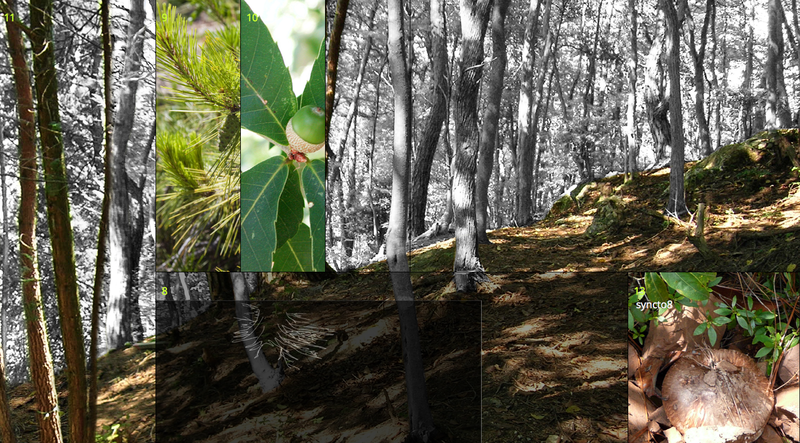 Made in collaboration with anthropologist Anna Tsing and Matsutake Worlds Research Group, the work aims to show different ways scholars might study temporal coordinations that make or break a dynamic forest ecology. The story follows the entangled histories and temporalities of four species: pine trees, oak trees, foresters, and wild matsutake mushrooms. The Fungal Clock is structured around three folds, or three ways of telling and making time: first is phenology, or events that are timed to seasons; the second is emergence, or creative changes that arise from unintended encounters between humans and nonhumans; and third is rupture, or large-scale disturbance that throws a historical continuum out of joint. Together, the three folds articulate how life and death in a forest are entangled through a multiplicity of variable temporalities. Figure 2. Elaine Gan and Anna Tsing, Fungal Clock: A Theory of Time in Three Folds, 2012–present. Screenshot of digital prototype, 2012. Time Machines (figure 3) is an ongoing print- and web-based project that articulates an analytic for studying modes of coordination. 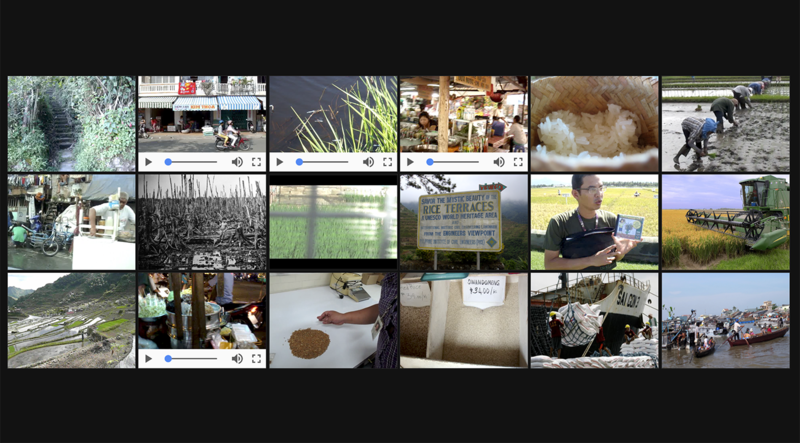 It tells a multi-sited story of the cultivation of rice through the epochal shift from Holocene to Anthropocene, a shift that has seen human industry, war, and global trade collide with the unruly capacities of more-than-human ecologies. To render continuity and change, the project invites readers into the sensible temporalities of human-plant coordinations. The project is organized around six time machines: each follows a type of rice and the biogeochemical-technoscientific assemblages that make its cultivation possible within a particular historical conjuncture. The assemblages are composed of significant others, or what Donna Haraway calls “companion species”: weeds, insects, fungi, animals, humans, as well as sunlight, rain, soil. Significant others appear in different forms, creative agencies, and intensities, and—without centralized command-and-control—enact coordinations that remake worlds. All six types of rice exist today and are situated in places that include the Mekong Delta in Vietnam, a rice research institute in the Philippines, rice fields in California’s Central Valley, and a seed vault in Svalbard, Norway. Figure 3. Elaine Gan, Time Machines, 2016–present. Screenshot of digital prototype, 2013. These three works pay attention to the social times of plants and humans as a way of considering the challenges of livability in the Anthropocene. The projects do not offer synthetic solutions for saving the planet or outsmarting global neoliberalism. Rather, they extend playful invitations into alternate ways of considering how life and death are mediated through history, geography, language, and technology. How does one describe and analyze relationships between things that may be as intimate and elusive as mycorrhiza or as large and disruptive as a hydropower dam? The close-up and the worldview offer inadequate descriptions. Indeed, both extremes can be dangerous in their obfuscations of dynamic yet uneven processes and significant yet incommensurable agencies upon which surviving the Anthropocene depends. The following are a few methods that developed organically through experiments and collaborations. They offer ways of crafting multiple views and coordinations with companion species. First, attention to plants trained me to begin with particular landscapes: rice varieties in tropical, rain-fed mountain provinces are different from those that grow in temperate, irrigated rice fields. Asking where is a way to situate our practices of knowing and attuning across difference. The Anthropocene is not a universal condition; it is not the same everywhere. Field visits and natural history observations are important. Second, landscapes are not fixed or passive backgrounds against which human history unfolds. Landscapes are dynamic carriers and historically contingent processes. It takes time to get to know them. Describing the multiple temporalities that inhabit, shape, and sediment into landscapes populated by humans, nonhumans, and machines is crucial. What happens in the dry season is different from what happens during the rainy monsoon season. Sometimes we need to slow down or speed up in order to even notice the lifeways of significant others. To analyze how things hold, change, or collapse, we must ask when and synchronize with the timing of seasonal cycles and ecological rhythms of plants and their assemblages. Third, temporalities are heterogeneous and do not march to the single beat of human progress or modern clocks. Gathering a range of historical, ethnographic, and scientific research—or entering into interdisciplinary collaborations—opens up our ability to sense and follow qualitatively different kinds of ontoepistemologies. Asking which temporalities are present when, and for whom particular rhythms become dominant or extinct in particular places and historical conjunctures, enriches our ability to specify relations of force that constitute continuity, change, and collective survival. In this essay, I have called for creative and critical experimentation—in short, play. While the camera and the digital computer have remade how we see and shape the world, they have also trained us to separate humans from nonhumans, to distinguish the situated close-up from the worldview, to compress differential temporalities into our single-channel documentary. They are power tools; they require thoughtful and artful engagement because they simultaneously open up and close down so much. Addressing the challenges of a new epoch named the Anthropocene requires us to tinker with these power tools anew, to play with methods that acknowledge companion species and how they make us human. My ongoing research in vegetal and fungal worlds has shaped, and is constantly shaped by, close attention to landscape (where), history and temporality (when), ontoepistemologies (which and for whom), and pluralities of encounter. Such attentions do not always bring solutions, but they incite ways of dreaming up better questions and, if we are lucky, occasions to learn how to live and laugh in more-than-human worlds—again and again. Walter Benjamin, “The Work of Art in the Age of Mechanical Reproduction,” in Illuminations: Essays and Reflections, ed. Hannah Arendt, trans. Harry Zohn (New York: Schocken Books, 1969), 236. T. J. Demos, Against the Anthropocene: Visual Culture & Environment Today (Berlin: Sternberg Press, 2017), 19. View Chronometers for Time Travelers online at elainegan.com/riceChrono.html. View Fungal Clock online at elainegan.com/fungalClock.html. Donna Haraway, The Companion Species Manifesto: Dogs, People, and Significant Otherness (Chicago: Prickly Paradigm Press, 2003). Donna Haraway, Staying with the Trouble: Making Kin in the Chthulucene (Durham: Duke University Press, 2016), 10.